Outlook Notifier is a free gadget-like software that display Outlook unread mail on desktop or logon screen of Windows 10, Windows 8, Windows 7 and Windows Vista. It displays current Outlook user name and inbox unread mail count on the desktop screen or on the logon screen like Windows XP and can be viewed constantly or popup when Outlook inbox receive new messages. 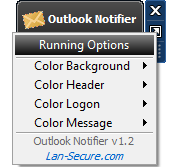 Outlook Notifier software can be customized for own personal needs using 3 gadget-like selection buttons: Hide button for closing the display until new messages arrived, Options button for selecting display viewing modes and optional display colors and Drag button for moving the display anywhere on desktop or logon screen. Take a quick tour to learn more about the software unique capabilities that will help you to display Outlook unread mail on desktop or logon screens. Outlook Notifier unread mail view for Windows desktop and logon screens display including current Outlook user name and unread mail messages. Outlook Notifier unread mail gadget-like Hide button for closing current software display from screen until new Outlook unread messages arrival. 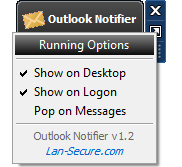 Outlook Notifier unread mail gadget-like Options button for selecting desktop and logon display and constant or popup viewing modes. Outlook Notifier unread mail gadget-like Options button for selecting favorite preferred display colors of the gadget-like popup window. Outlook Notifier unread mail gadget-like Drag button for moving current view to any preferred location on Windows display screen. Learn more about the software key features to complete your knowledge about the available operating capabilities that the software has to offer. Free desktop and logon gadget-like Outlook unread mail messages. Hide button for closing current display until new Outlook messages arrival. Options button for selecting preferred display and viewing modes. Options button for selecting favorite preferred display colors. Drag button for moving display anywhere on the screen. Verify the pre-installation requirements of the software to ensure smooth and easy installation and operation on your computer.